Since last August, this blog has been silent. This does not mean that I have been out of action, far from it. Since the fall, I have been very busy with two contracts, both at Tilburg University. 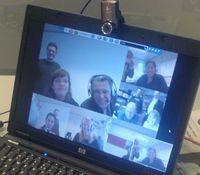 My main contract is as a project manager for the implementation of a student portal, the other one concerns assisting in the development of a blended learning videoconferencing system for law students doing their internships at different law firms in the Netherlands (see picture). It's been a very busy half year, in which I have learned a tremendous amount. All of these years in academia have provided me with many high-level ideas and contacts, which I can put to surprisingly good use in my current work in the trenches. It is fascinating to see how trying to design and build real, useful systems, instead of just esoteric lab prototypes, helps in galvanizing thought, and, I am convinced, ultimately also in producing better theory. My scientific background helps me in capturing wicked (design) problems as socio-technical system puzzles. The complexity and pressure of real-world implementation, on the other hand, forces me to see much more clearly the intricate relations between relevant theoretical concepts, which often remain hidden in academic thought exercises. One reason I left academia was that I strongly believe that community informatics requires a design science, in which theory gets injected into the design and implementation of actual systems, covering the full range from initial prototypes to large-scale systems-in-use, to be tested, refined, and reimplemented continuously. Unfortunately, the insane publication pressure in universities increasingly does not provide researchers with enough time and resources to go beyond the scantiest of implementations, and thus the adequate testing of their (design) theories. This is a very worrisome development, as it creates an ever widening gap between theory and practice, whereas they should be regarded as two sides of the same coin. It's been long, way too long since my last post. The good news is that I am back, and with a vengeance! The past year has been a soul-searching time for me. Basically, all my working life I spent in academia. It has been a most valuable experience, allowing me to develop a rich set of ideas, and to meet many wonderful, committed, and creative people from all over the world through conferences and research visits. However, academic life has also been frustrating. The, unfortunately ever increasing, obsessive publication and project acquisition pressure in universities made it increasingly difficult for me to balance work and life and to focus my efforts where my heart lies: the development of community applications that make a meaningful contribution to society. I have therefore taken the bold step to leave academia, and start my own research consultancy company, CommunitySense. My mission is to be a linking pin between academic researchers and practitioners in the rapidly advancing field of community informatics, and to translate state-of-the-art research insights into practical solutions that work. For more information on my experience and interests, see the CommunitySense website. Welcome to my blog. It is finally there. Many friends and colleagues have urged me to start one. The initial occassional prod ("hey, check out this hot new tool") had turned into a deluge of increasingly urgent requests ("where are you? you can't stay behind. Everybody cool and with something to say has one!"). I don't know about the cool, but I definitely have something to say, so: here I am. So, what is this blog with the strange name about? I am not going to use this blog (just) to talk about me. Instead, I would like to experiment with how it can be used to facilitate research. As a researcher, I am passionate about my main topic: the evolution of virtual communities. Originally, the Internet was mainly used to support work and play by individuals. Important, but the real power of the Internet is in facilitating communities of people sharing ideas and working together on common goals. In an increasingly complex and chaotic world, virtual communities may turn out to be crucial in making sense of the many serious societal problems, and in providing timely and acceptable solutions. Many kinds of virtual communities exist: globally distributed research communities working on a particular theory or real-world problem, e-business communities, political communities of concerned citizens, and so on. Although the importance of virtual communities is clear, much of their potential is not realized. Many never reach maturity, become paralyzed, or die before they have accomplished their goals. Virtual communities are living organisms: they have (or lack) energy, grow, and have a lifecycle. To make them successful, their evolution needs to be fully understood. Research on the evolutionary dynamics of virtual communities is still in its infancy. With this blog, I hope to contribute to a fascinating and much-needed research discussion on how to alleviate the growing pains of virtual communities.